Newlyweds Ruby and Jimmy Hawkins are sure their love will survive the trauma and tragedy of war. 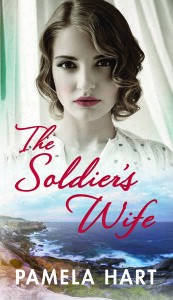 Amid the desperate battles raging in Gallipoli, Jimmy dreams of the future they planned together. In Sydney, Ruby reads his romantic letters full of love and longing. But as weeks slip into months Ruby must forge her own new life. When she takes a job at a city timber merchant's yard, she is thrown into a man's world fraught with complications. And as the lives of those around her begin to shatter, Ruby must change if she is to truly find her way. Is she still the same woman Jimmy fell in love with? Inspired by a true story from the author's own family history, THE SOLDIER'S WIFE is a heart-soaring story of passion, love and loss and learning how to live when all you hold dear is threatened.